Located in Southwold, Suffolk the Pier was first constructed in 1900 by the company that operated the Belle steamer boats; W Jeffery designed the architecture for the pier. Back then the pier was originally 810 feet in size and was built as a landing stage for the Belle steamship that used to pass by from London Bridge. Up until the early 1930s the majority of holiday makers took their holidays via the sea, and boats were a popular source of transport. The pier was once alight with happy post Victorian holiday makers. It used to be busy with families that fled to the seaside for a much needed summer holiday. As times changed and technology progressed, unfortunately the pier lost some of its former glory; in 1934 the landing stage that used to be a T shape was washed away in a fierce storm. Southwold pier has many a tale to tell and holds an excellent history, in fact after the storm that took away the landing stage, Southwold pier underwent some renovation works. The contractors transformed what once used to be wooden buildings towards the shore side into a two storey pavilion, which also had a theatre hall and arcade to keep holiday makers entertained! Yes what pier could be complete without an arcade? The entire concept of summer holidays would be short lived if there wasn’t a pier by the seaside that came complete with holiday entertainment to keep the family busy during the summer months. Piers never fail to attract tourism and the piers immense history leaves many a tourist is left standing in awe upon reading about it. The seaside companion has seen both bad and good times. When the Second World War broke out, as a security measure the pier was sectioned off. This made it inaccessible to the public as there was a great fear that the Germans would invade. Later on in 1941 Southwold pier was hit by a sea mine that drifted by, taking some of the pier away. 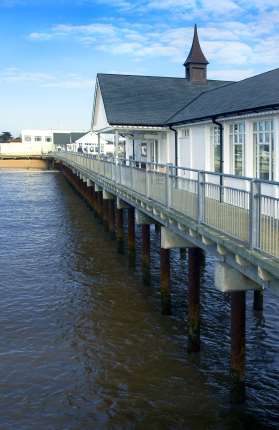 Inevitably more of the pier was damaged and the Southwold beauty was left in need of repair. Although it’s not all stories of sadness as in 1948 the holes in the pier were repaired. Later on in 1955 the pier was then hit again by a fierce storm and the end half was completely washed away. Years of neglect meant that when another storm struck in 1979 southwold pier was reduced to a mere 60 feet in length, a fraction of its original 810 feet length. The pier plays an excellent role in the history books and can tell many a tale of happy children eating ice cream, whilst taking a summer holiday stroll down the pier with mum and dad. In 2005 Stephen Bournes purchased the pier as a business venture and he is to date the proud owner of the glorious structure. It’s an excellent achievement to manage a pier and to keep the restoration above board. Stephen has seen to it that the pier is not left short of entertainment there is an on pier arcade where the kids can let loose and enjoy the games. There’s no need to worry if you have forgotten your bucket and spade as the pier also houses a shop (the bucket and spade beach shop) that’s packed full of all your holiday essentials! Taking a stroll down the pier could leave you feeling a little peckish so before you begin you can take in the Promenade Café which is open from 9am where you can enjoy a breakfast of bacon and eggs. Further along the pier is also the Boardwalk cafe, where you are able to savour the taste of locally caught fish. You are able to purchase meals from just 10 pounds. The pier is home to a hand built selection of Tim Hankins machines! All the wacky inventions can be found in The Under The Pier Show. There’s a shop called the clock house that you can purchase all your seaside memories from! They have handmade chocolates down to handbags and cups! Southwold pier is crammed full of holiday entertainment for the perfect family holiday. A British seaside holiday is always the best, with the fresh air of the sea, and the accompanying odour of the freshly cooked fish and chips! Entertainment needn’t be a one way venture; it’s often difficult to cater for all the family’s needs. But Southwold pier has been structured in a manner that makes sure there’s a holiday activity to do for everyone. 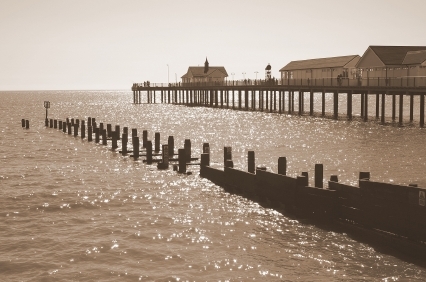 Britain’s many piers have had the glory taken out of them but Southwold pier is one holiday attraction that you can be sure to be able to sit down and tell the kids about. All piers in the UK, at one time served the purpose of being able to be used as landing stages for some of the many ships that travelled by in the UK. The ships used to house holiday passengers; however that was in the past! So if you like to be beside the seaside, eat fish and chips, be around family entertainment and take a stroll down the prom, prom, prom! 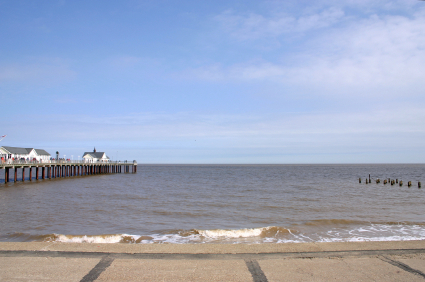 Whilst taking the perfect holiday break, Southwold is the perfect tourist destination to spend your summer holiday. And the Clock house food and drink cafe. Summer (May – Sept) open from 9am. Winter (Sept- May) open from 10am. I am very concerned abut the future of Dunoon pier on the west coast of Scotland. Our lovely Waverly comes to visit you, literally “doon the water” to you from the Clyde. I would be very grateful if you would consider sharing the story of your pier renovation with us in Dunoon and tell us how you went about reclaiming your waterside heritage. Please have a look at our facebook page – Dunoon Pier – The Future. With thanks and best wishes for the future of Southwold Pier.